Although there was an organized community in Tomar at the turn of the fourteenth century, indicated by the inscription on the tombstone of Rabbi Joseph of Tomar, who died in Faro in1315, it was not until 1430 that the Jews of Tomar had the means to undertake construction of the synagogue that still stands today. It was completed in 1460. After the expulsion of 1496 the synagogue was converted to a prison, then used by successive owners as a hay barn. 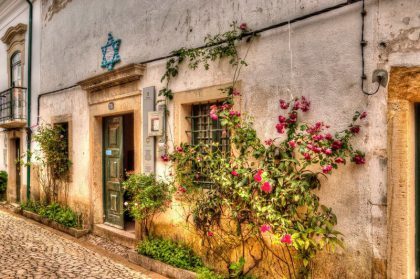 In 1920 a group of Portuguese archaeologists identified the building as a synagogue. It was placed on the historical register in 1921. In 1923 the engineer Samuel Schwartz, who worked in the region’s mines, heard about the building and bought it. In 1939, after carrying out initial restoration work, he donated it to the state with the proviso that it set up a Portuguese-Jewish museum there. The synagogue is supported by four fine columns at the center, reminiscent of these in the Portuguese church at Ourem made by Hispano-Moorish craftsmen. Indeed, the same builders could well have been involved here. Recent excavation has revealed parts of the mikvah. Several coins from the age of King Alfonso V (1446-81) and everyday tableware have also ben found. The facade and entrance are modest and unremarkable. Upon entering, several steps lead down to the floor, which, below street level, made it possible to reduce the height of the facade. Another noteworthy curiosity is the necks of vases built into the four corners. Apparently they were designed to amplify and improve the synagogue’s acoustics. The synagogue is no longer used for worship.